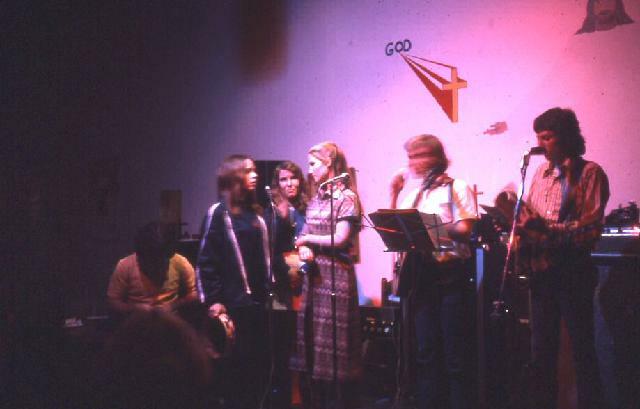 The House Band: featuring Dr. Bob Whitesel (right). Dr. Whitesel is an internationally known seminar speaker on church growth and is the author of several books including Growth by Accident – Death by Planning: How Not To Kill a Growing Congregation (Abingdon Press, forthcoming). In 1971 he helped form the house band while attending Purdue University. After the coffee house days, he studied a Fuller Theological Seminary where he received his Doctor of Ministry Degree. Bob ministered in theatre for several years and is the founder of C3 International (Creative Church Consulting International) of Winona Lake, IN. He is also an adjunct instructor at Indiana Wesleyan University.